Greetings again from the darkness. Allowing three regular guys to play themselves in the cinematic re-telling of their courageous and heroic actions is a fitting tribute to the men, and it’s an approach that we must be willing to cut some slack. On August 21, 2015, a terrorist aboard the Thalys train bound for Paris was thwarted in his attempt to carry out his mission of evil. Spencer Stone, Alek Skarlatos, and Anthony Sadler ultimately subdued the terrorist (who won’t be named here), likely saving many lives. The real world heroics fall right in line with director Clint Eastwood’s two most recent films, SULLY and AMERICAN SNIPER. Unfortunately, while we admire his decision to allow these heroes to re-enact their life-saving bravery, we can’t let slide the downright boring first two-thirds of the film taking us through the origin story of their childhood (Sacramento 2005) to the backpacking trip that put them on that train. Some of the scenes are inexplicable. For instance, Judy Greer and Jenna Fischer play the mothers of Spencer and Alek respectively, and their confrontation with the boys’ elementary school teacher is a candidate for the worst and most embarrassing scene of the year. 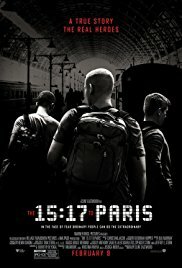 Based on the book “The 15:17 to Paris: The True Story of a Terrorist, a Train, and Three American Heroes” (written by the three men and journalist Jeffrey E Stern), the script is adapted by Dorothy Blyskal, and when combined with some of the director’s choices, generates some unintended audience laughter … rarely a good thing. Watching three regular guys – three lifelong buddies – retrace their steps through Germany, Rome, Venice, and Amsterdam is almost tolerable because these are really nice guys. However, we can’t get over the feeling that we are watching home movies of our friends’ trip – a trip we weren’t even on. Jokes about selfie sticks and hangovers don’t make it any easier. When the film finally gets to the moment of truth on the train, we end up where we should have started … admiring the heroics of three regular guys: Spencer Stone, Alek Skarlatos, and Anthony Sadler. We witness then French President Francois Hollande awarding them with the Legion of Honour. Themes of God, military and friendship are commonplace in Eastwood films, and eagle-eyed viewers will catch a glimpse of Alek wearing a “man with no name” t-shirt (in honor of the director). Bottom line, it plays like a film about nothing – until the end when it’s really about something special. This entry was posted on Thursday, February 8th, 2018 at 8:36 pm and is filed under Drama, Thriller. You can follow any responses to this entry through the RSS 2.0 feed. You can leave a response, or trackback from your own site.